I want the subtleties in my playing to be heard as well. Which means, I need an instrument with the largest possible band-width: in its tonal spectrum deep down AND high up – in its dynamics very quiet AND very loud – in its response both light AND aggressive – and all of this available always. At all times I want to have the reserve of a full sound spectrum, to draw from it as needed. I build my popercussion cajon drums from a high-grade combination of 7 layers of Poplar plywood with an Ash veneer – two excellent sound-woods that have long been popular in guitar making. The union of the soft but tough Poplar with the hard Ash surface creates an especially balanced and “sweet” tone. The soundboards are from highest quality Birch (“aircraft plywood”) and without veneer for optimal response. I do not use any muffling in my cajons, neither for snare nor bass. This is how I achieve the fullness and presence of sound in my instruments. All sound control is inherent in the design. I want the full power, so volume and sound can unfold freely. This is an all-round cajon, with a wide variety of tones. It’s easy to fit into any sound requirement – Flamenco, Rock, Jazz, Folk, Celtic / Irish Music, Latin, Country/Bluegrass, Singer/Songwriter and many more. Compares to: Jazz drumset with a very lively snare and perfectly rounded kick drum. Front: Soundboard with «Clap-Corners». Lively and - if needed - loud snare. Bass: Punchy and resonant, with a light sustain. Back: No strings, closed all around, with conga/bongo-like sounds Shell: 7 layers of Poplar with an Ash veneer. Soundboards: : Birch, no veneer. Dimensions: 11.75" x 12" x 18"
A fusion of Flamenco Box and traditional Peruvian cajon. The best of two worlds: Flamenco on one side, age-old tradition on the other. Ideal for everything described under Flamenco Box, plus: Afro-Peruvian music, as well as sound changes in the middle of a song, or when you can’t decide which model to get. Compares to: Jazz-drumset with a world music note. Front: The front of the Flamenco Box with «Clap-Corners» and a lively snare. Bass: Punchy, with a shorter sustain. Back: Soundboard in traditional Peruvian style, partially loose and attached with screws, dry «South American» sounds. Shell: 7 layers of Poplar with an Ash veneer. Soundboards: Birch, no veneer. 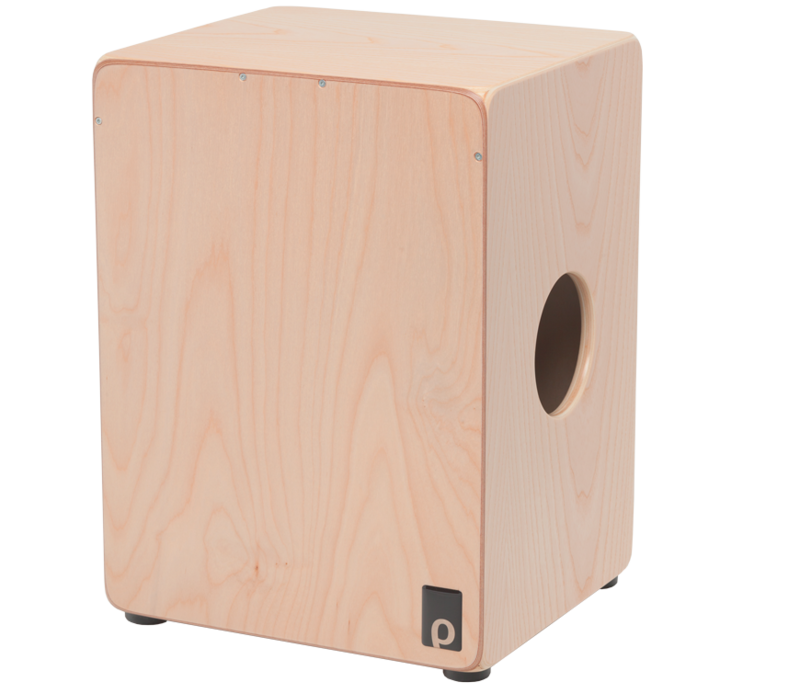 Dimensions: 11.75" x 12" x 18"
Powerful: cajon with a wider body; crisp snare and a deep, fat bass. Big, just enormous sound, incomparable and unrivaled. Perfect for Brazilian music (surdo-like bass), Latin, African drumming, drum circles, dance class accompaniment, all things tribal or medieval, and of course Jazz and Rock’n’Roll. Compares to: John Bonham’s kickdrum and snare together in one box. Front: Soundboard closed all around, no pronounced «clap-corners». Lively and – if needed – loud snare. Bass: Low and full, with sustain. Back: No strings, closed, with low conga/bongo-like sounds. Shell: 7 layers of Poplar with an Ash veneer. Soundboards: Birch, no veneer. Dimensions: 3.5" x 12" x 18"
A fusion of BigBass Box and traditional Peruvian cajon. The best of two worlds on a large frame: the huge sound of the BigBass Box on one side, traditional primal power on the other. Ideal for everything described under BigBass Box, plus: Afro-Peruvian music, quick sound changes and of course when you can't decide which model to get. Compares to: John Bonham's drumset plus world-music. Front: The front of the BigBass Box, closed all around, no pronounced "clap-corners". Lively and - if needed - loud snare. Bass: Low and full, with a shorter sustain. Back: Soundboard in traditional Peruvian style, partially loose and attached with screws, dry "South American" sounds. Shell: 7 layers of Poplar with an Ash veneer. Soundboards: Birch, no veneer. Dimensions: 18"x13,5"x12"
All popercussion cajons are double-sided and essentially two instruments in one box, with two completely different palettes of sounds: bass and string-snare on the front, and conga or traditional Peruvian sounds on the back. The two soundboards are parallel – they resonate together to give my drums their lively bass tone with its characteristic sustain. In contrast to traditional cajons, the soundhole is in the side of the shell. The snare sound is produced by four custom strings on the back of the front soundboard. The strings are made for popercussion to my specifications. They are mounted on mandolin tuners and can be adjusted individually with a quick reach of the hand without any tools. In addition to the snare sound, Flamenco Box and Yayo Box feature a further high-end sound on the front side: a wood-on-wood «clacking» that is produced by slightly open upper corners – «Clap Corners» – of the stringed soundboard. This is independent of the rattle of the (non-string) Peruvian soundboard, as used on the back of the Yayo Box. Ergonomically rounded corners and edges, soundboards without veneer, and clear finishes and colors are central to my approach. I build cajons from the best materials, with a timelessly purist design, exacting «Black Forest» workmanship, and much love for detail. And of course they are nice to the touch. 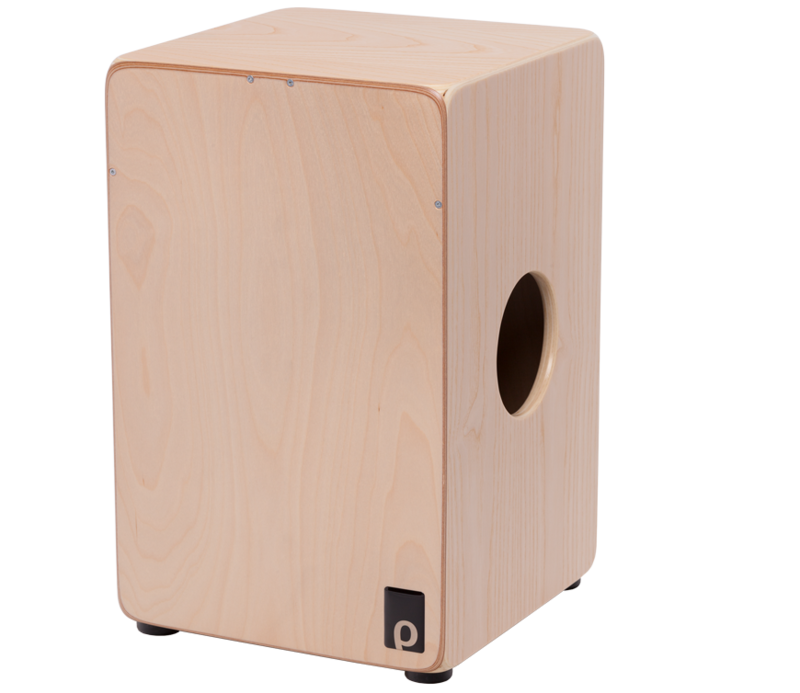 popercussion cajons are optimized for extremely high dynamics in sound and volume. They can be very loud if needed, and can also be very quiet, because they respond to the slightest touch. So they are easy to play, but can be very assertive in interplay with other instruments. I was born in 1962 in Lahr, in the Black Forest area of Germany. I grew up in and around Lahr, Pforzheim, New Zealand, Karlsruhe, Freiburg, Southern France, Los Angeles, Southern California, and again Lahr. I’m a percussionist/singer/musician, cajon-drum maker and percussion teacher, and have been building and playing cajons since 1988. Until 1990 I was the percussionist with Freiburg-based Flamenco group “Los Crotalos”, and traveled extensively during that time in France and Spain, playing, among others, with members of the Gipsy Kings. In 1990 I moved to Los Angeles, USA. I lived there until 2007. From 1990 to 1992 I studied at the Grove School of Music. Among my percussion teachers were Bob Fernandez, John Bergamo and Luis Conte. In Los Angeles I worked as a freelance musician in Jazz, Rock and Flamenco. I was the first cajon player ever in the LA Flamenco scene, and through the years I played with virtually all the important Flamenco artists on the American West Coast. Tours brought me to other parts of the US, Japan, and parts of Europe. In the area of Jazz and Rock I was lucky to share the stage with musicians like Angel Figueroa (Herbie Hancock, Maxwell), Spanish entertainer Charo, Heavy Metal band “Tribe After Tribe”, Jazz veterans Riner Scivally and Isla Eckinger, LA House-DJ Sol, and many others. I was the drummer/percussionist of the Spoken Word/HipHop band “Andthensome”. For Jennifer Lopez, I developed the rhythms and played cajon and palmas for the cajon-dance duet in her video of “Ain’t It Funny”. I first built cajons for my own use in the late 1980’s when I began to play Flamenco and found out that I could not buy the instrument anywhere. After 10 years as a professional musician in Los Angeles I started popercussion in 1999, turning my old hobby into a part of my professional life. My high-end cajons quickly found a place in the hearts of professional musicians in the US, Canada and Australia. They have been used in songs by artists as varied as Jennifer Lopez, Los Lobos, David Sylvian, Pink Martini, Lila Downs, Sara Bareilles, and many more. In 2007 I moved back to Germany. I now live in Lahr, my hometown. In addition to building popercussion cajons I work as a teacher at the Lahr Music School, as a cajon/percussion workshop leader, and as a percussionist for bands and artists like Maeve Kelly (Singer-Songwriter), Modi Vivendi (Renaissance-Pop), and MadrugáFlamenca (Modern Flamenco). All Credit Card payments are processed through Paypal. We will send you a Paypal invoice and you can process your payment directly and securely from there. .
We will send you our bank information when confirming your order. Please ask about bundle rates if you would like to order 2 or more cajons. Shipping prices do not include possible additional custom fees and/or import taxes in countries outside of the EU. Please enquire with the authorities in your country. Feel free to contact us with any questions, special requests, or if you are unsure which model is right for you. We are happy to discuss your wishes and needs. We are a small, highly specialized company, and live from personal connections and word-of-mouth advertisement. We'll do our best to guarantee your satisfaction with your popercussion cajon.